Accra, Dec. 21, GNA- The functional Executive of the National Democratic Congress (NDC), on Tuesday suspended Dr Nii Josiah Aryeh, the General Secretary of the main opposition party, over his relationship with the ruling New Patriotic Party (NPP) during the run-up to the December 7 General Election. The decision followed an interim report submitted by the Committee appointed to investigate the alleged misconduct. A press statement issued by the Chairman of the NDC, Dr Obed Asamoah said the National Executive Committee of the Party, would take a final decision, after the Committee has submitted its final report in January 2005. Mr Bede A. Ziedeng, Deputy General Secretary in-charge of Operations has been appointed as the acting General Secretary. Dr Aryeh, hit the headlines in November, this year, over speculations that he had compromised his official position by collecting 3,000 dollars from officials of the NPP after he had complained over his state of insolvency. The Law Professor had since denied the allegation claiming he was framed up. Bagbin Condemns His Party General Secretary The chairman of the committee is investigating the near defection of the NDC's General Secretary Dr Josiah Aryeh. The Minority Leader in Parliament Alban Bagbin who is head of the three-member committee said investigations are still on going and that a final report will be presented to the Functional Executive Committee of the party. “I am surprised as to how the General Secretary got to know the number of people who appeared before the committee and what evidence the committee had because he is not supposed to know”, he said. 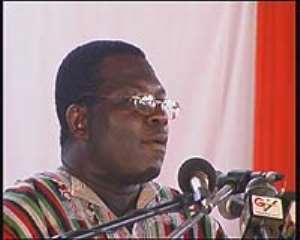 The Committee yesterday suspended Dr Josiah Aryeh pending final decision next month after submission of a final report. He said it was not the committee that recommended the suspension of the Gen Sec, He however pointed that Dr Aryeh had no business meeting this political opponents to talk about the NDC. “It is unacceptable for the General Secretary to have those meetings and discussions with members of the opposite party and make some statements, adding that for administrative purposes we thought it was better not to have him in place whiles investigations are on-going.